In our previous blog, we looked at how installing decorative aluminium shutters can be excellent value for money. Not only because you can dual install our security shutters on the ground floor and save by installing aluminium shutters on the upper level of your home, but another vital point was also raised. We mentioned that looking after and maintaining your decorative aluminium shutters can further add value to and lengthen the lifespan of your shutters. When you take care of your shutters, they look good for years and years to come. Aluminium window shutters require little maintenance, unlike wooden window shutters. Furthermore, you need not repaint shutters that have been coated. Yes, we offer our aluminium shutters in any standard colour. It’s all about our protective base coat. House of Supreme Shutters are all powder coated with a high-quality powder which protects the shutters from weathering and makes them quite durable. They are UV resistant as well making them perfect for indoor as well as outdoor use. Here are three tips for keeping your decorative shutters well maintained. Cleaning or maintaining your shutters should be done at least in 3 to 6-month intervals depending on where they are installed. If you reside close to the sea or in an industrial area, they would require more attention, and we recommend a monthly clean in these areas. Furthermore, we recommend that you use a mild detergent when cleaning as it will counteract the effects of acid rain and other pollutants. To preserve the powder-coating on the decorative aluminium shutters, you need to clean them regularly. Deterioration of the coating occurs as a result of grime and by contaminated moisture. 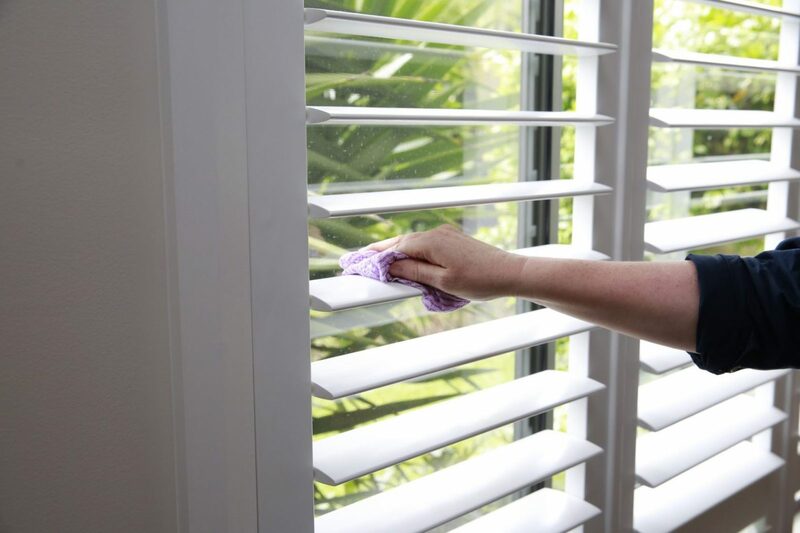 Failing to clean your shutters regularly will cause permanent damage to the surface. This damage is irreversible, and deterioration will occur relatively quickly. However, it is vitally important to refrain from using heavy chemical agents to clean your decorative aluminium shutters. These will damage the powder-coating and cause the same effect as not cleaning them at all. Rather use a mild detergent and dilute it with warm water. If you live in an environmental area with low pollutants, your shutters wouldn’t need much maintenance. Dusting them carefully and then wiping them down with warm water and a soft sponge will help keep the dirt away. For more stubborn stains we recommend using a neutral cleaning agent (dishwashing liquid for example). This will not harm the aluminium or base coating. In our last piece on aluminium shutters in this series, we will take a look at some of the technical aspects that set our House of Supreme decorative aluminium shutters apart from the rest. This entry was posted in Aluminium Shutters and tagged aluminium security shutters, Security Aluminium Shutters, Shutters. Why Choose House of Supreme Decorative Aluminium Shutters?